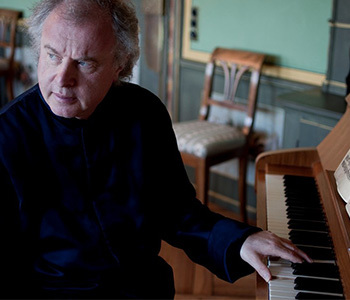 Today brings the second instalment of Sir András Schiff’s second survey of Schubert’s late piano music on ECM, comprising four works written towards the very end of the composer’s short life: the Four Impromptus D899, the Drei Klavierstücke D946, and the two Piano Sonatas D958 and 959. The Hungarian-born pianist recorded this repertoire to great acclaim on a modern piano in the late 1980s and early 90s, but in the intervening years he’s fallen in love with the instruments of Schubert’s time and found still more introspective poetry in the music in the process. Part of the magic of this recording stems from the instrument itself, or rather from the obvious long-established synergy between that instrument and its player: Schiff uses the Franz Brodmann fortepiano (dating from 1820, roughly two decades before this music was composed) which he purchased in 2010 and has described as ‘ideally suited to Schubert’s keyboard works’. Though the instrument is usually resident in Bonn’s Beethoven-Haus (where the recording was made), Schiff is so attached to it that he transported it to Wigmore Hall to perform these works in 2015 and 2018, and also used it for his earlier volume of late Schubert on ECM. In additional to the soft and sustaining pedals, the Brodmann also possesses a bassoon-stop which produces a buzzing effect in the lower regions of the keyboard when deployed, and a ‘moderator’ which takes the edge off the attack throughout the registers and facilitates some wonderfully introspective playing in the opening stretches of the C minor Impromptu and in the slow movements of both sonatas. Perhaps the most striking quality, though, is the instrument’s uncanny similarity to the human voice – unlike most modern pianos, the Brodmann has markedly different timbres in each of its three registers, to the extent that there’s an audible ‘passaggio’ between the bass and middle ‘voice’ and the middle and treble. In a brief but insightful video-interview for ECM, Schiff observes that Schubert was ‘quintessentially a composer for the voice...even when he is writing for the piano alone’, and he draws on the vocal qualities of the instrument with the skill of a great singer in full command of their own personal sound-palette. The tarantella finale of D958 is a case in point, all silvery filigree in the treble and dramatic leaps into ‘chest-voice’, the register-shifts embraced in all their glory thanks to his variety of touch and imaginative use of the additional stops. Other pianists have underlined the whimsical humour of this music more boldly than Schiff, whose understated wit plays out with the musical equivalent of an imperceptibly raised eyebrow rather than a full-on wink, but the deliciously gallumphing bass interjections here are the exception to that rule and have all the earthy brio of a buffo baritone chipping in with sardonic asides in an ensemble from a Donizetti opera. Those distinct registers also play out to marvellous effect in the many cantabile sections of the impromptus and sonatas alike, where Schiff (a lieder pianist par excellence) seems to be giving a one-man song-recital without words – the thinner-than-usual strings in the bass allow the middle register to sing pianissimo without being swamped, and this works wonders in passages like the melancholy barcarolle of D959. There are also several instances where the Brodmann suddenly takes on the qualities of a chamber-organ, notably the hymn-like second theme of D958’s opening movement and the magical moment halfway through the scherzo of D959 where the music-box tinklings of the main theme gives way to a chorale-like oasis of calm. In that video-interview which I mentioned earlier, Schiff defines Schubert by ‘his modesty, his humility, his lack of ego’; the same qualities are evident in every bar of these performances, which quietly command absolute attention rather than clamouring for it. These are profoundly affecting interpretations born out of a long-term loving relationship with both music and instrument, and ones to which I can see myself returning for years to come.